Heat water in a pan, add spinach,garlic, ginger & g.chilles. Allow to boil 1 or 2 mins & starin the water. Grind a fine paste & check the seasoning. Serve with rice or paratha or breads. simple, healthy recipe. btw, you have forgotten to include salt in this. Nice recipe and a very bright and nice photo. Read the recipe i some seconds....so simple n healthy lol..
Vibaas- seasoning is the term used for salt & pepper in a prof kitchen. this is new for me,..looks yum..
Nice green color and very simple. Thats quick,healthy and simple sri..Nice color.. Delicious and a healthy puree should taste great with dosa!!! Wow such a vibrannt green colour. 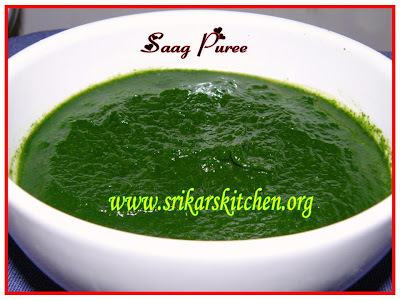 Simple, quick and healthy saag puree! Healthy,easy and lovely colour puree! Good one i love green puree. Simple and healthy recipe. Nice recipe. This is new to me but it sounds delicious and very healthy.